We had a great day today training some of the team at the Marriott Hotel in the center of Bristol. We have been working with them for a few months now and they have been such a pleasure to work with. Today we had the luxurious conservatory which had so much space to train in. All of their bunch got totally stuck in and enthusiastic which always makes our job easier. We trained in Emergency First aid at work today which was a first for almost everyone of the delegates. It’s such a great course for covering so many of the basics of first aid and really builds confidence quickly. As with all of our courses we make sure that we get to do loads of first aid scenarios. This get the blood pumping (excuse the pun) and people thinking. We have found that over the last few years we are working more and more with business and people from the hospitality sector. 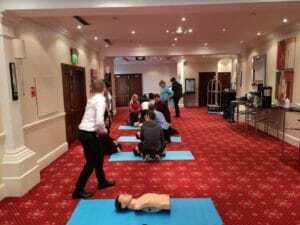 As people become more and more aware of the benefits of training in first aid this sector is growing. If you work in hotels, catering or hospitality, get in touch today to find out more. Our first aid courses can be tailored to suit your specific requirements. First aid can help save lives and this can really grow the confidence of your team.